Each year we build one coach that deserves to be called Epic. 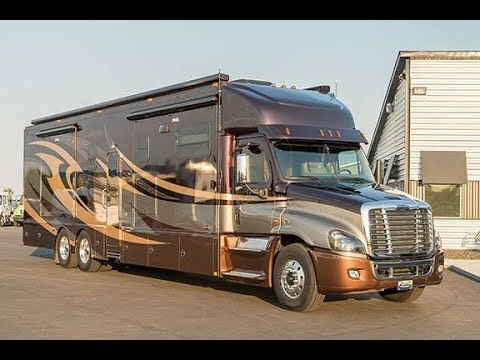 This year’s IWS Epic RV is based on a custom ordered Freightliner Cascadia Chassis specifically designed by us. For power, we chose the massive Detroit DD16 Engine that produces 600 hp. In our opinion, this is one of the best engines available on the market today and is the perfect choice for such an Epic Coach build. 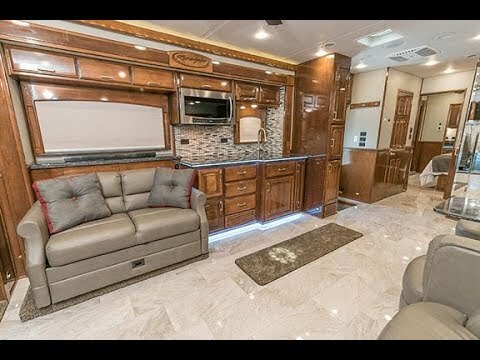 For the Conversion portion, we started with the Renegade Classic Coach and let the engineers dream up a huge quad slide, floorplan. We worked hard to make this coach the best of the best in function, performance and luxury. Too keep you warm in the coldest winter and cool in the hottest summer, we installed our IWS Extreme Weather Insulation Package that gives this coaches walls and ceiling an incredible R-25 insulating value. As for the air-conditioning, how about (3) roof mounted 15,000 BTU air conditioners. For the heating, we had the Aqua Hot, Hydronic Zoned Heating System installed. When it comes to entertainment we pulled out all the stops. Starting in the Cab with an Upgraded Stereo System whether you enjoy the crisp sound of a classic, or a good old 80’s rock song, this system delivers. In the living quarters, we installed a 49” TV that electronically raises and lowers out of the handcrafted cabinet behind the love seat. We also installed a second 43” TV in the Living Quarters Cabin. The TV’s in both Living Quarters are connected to a Full Home Theatre and Satellite System. We also installed the Top of The Line Wi-Fi-Ranger Wi-Fi Booster to help you attain the best Wi-Fi coverage possible. In the bedroom, we installed a large 43” TV along with a Blue-Ray player and Direct TV prep Package. For décor, we special ordered Charcoal Colored Ultra Leather from the Brissa Distressed Collection. This fabric is soft and supple, yet extremely stain resistant and durable. For the flooring, we selected a lighter colored High Polished Ceramic Tile called ‘Oly Must’ and used it throughout the entire coach. Don’t worry about getting cold feet because we also installed heated flooring in this coach. We didn’t stop with tile on the floors; we also had the Renegade Craftsmen build a full tiled shower for this coach. We continued our design approach to the outside of this coach and included features only available on the world’s finest coaches. We had Renegade apply a 4-color custom paint package with double clear coat to give an amazing appearance and deep luster. To further enhance the outside, we also installed an impressive 32ft long roof mounted awning with L.E.D lighted Lead rail. We put our heart and soul into designing the absolute finest coach we could. The result is a truly Epic Coach by Renegade and IWS. This coach is in stock now, and is offered on a first come first serve basis. Driver Controlled Rear Traction Control for Both Rear Axles. Adjustable Tilt and Telescoping 18” Leather Wrapped Steering Wheel. Deluxe Paint and Graphics Design for Classic 4 Colors with Double Clear Coat. Price includes Stock Renegade Graphics with Customer Custom Colors. ZipDee Driver Side Roof Mounted Non Functioning Awning Housing. This Housing Matches the Housing of the Passenger Side Awning and Gives the Coach a Very Balanced Look. Additional Winegard In Motion Satellite Dish. Wi-Fi Ranger 11-Elite Pack FM Wi-Fi Booster with Roof Mounted Antenna. Outside Entertainment Center with 32” LED TV and AM/FMCD Stereo. Includes Alpine 7″ INE-W957HD In dash Stereo, CD /DVD Player. Includes Pandora, Sirus XM Radio with Navigation also Includes IPhone Siri Eyes Free and Bluetooth, (1) Amplifier, (4) Mid-Range Speakers with Crossovers, (4) Tweeters and Powered Sub Woofer.